All items are available for viewing on approval. 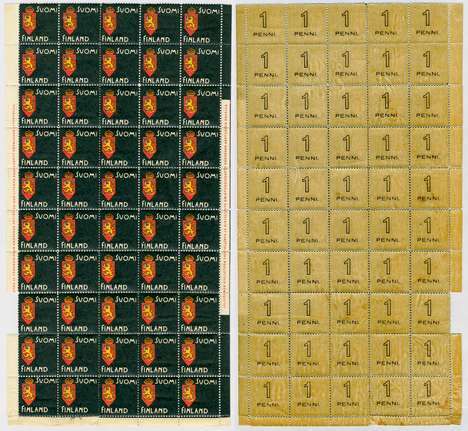 I have a substantial and constantly changing stock of Danish (and other Scandinavian) adveritising, patriotic and political, and collector series labels, including a tremendous range of topics. What are you seeking? 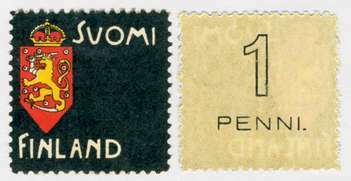 The Finnish "Mourning Stamp" is actually a privately produced label without franking value. It had a purchase price of 1 penni, and "1 PENNI." is printed on the backside. 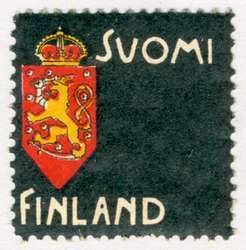 It was designed by the famous Finnish artist Akseli Gallén (Gallen-Kallela) and used in protest of the Russification of Finnish stamp designs. 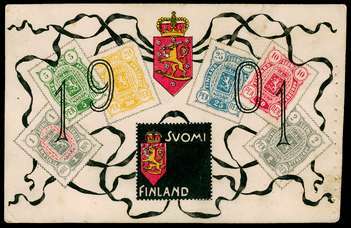 Starting 14 August 1900, the previous Finnish stamp designs could no longer be used on mail sent abroad; instead Russian design stamps had to be used. 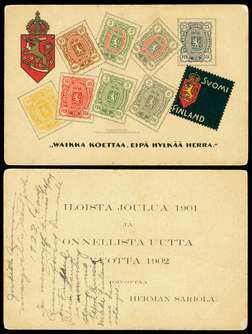 (Previously on 1 January 1892 Finnish design stamps had been banned from mail addresssed to Russia.) 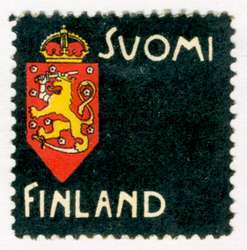 On 14 January 1901, Finnish design stamps were banned from domestic mail use, completing the Russification of stamp designs. Mourning Stamps were intended to be placed next to the postage stamp as a protest, but were quickly banned. Domestic mail bearing them is rare. However, in coastal areas, letters bearing Mourning Stamps were placed in the mail boxes of ships heading abroad; such covers were canceled upon arrival at the next (foreign) port of call, usually Stockholm, Sweden. Such covers are scarce. 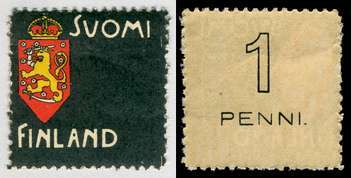 Used singles of Mourning stamps with readable town and date are very desirable, though it is usually very difficult to read the cancellation due to being black on black. There were several printings of the Mourning Stamps resulting in visibly different types, though some printings are difficult to distinguish. I am not aware of any published detailed cataloging of the printings / types beyond what is listed in Facit (please let me know if you have further information). In some cases, the difference in printings can be seen in the size of the printed sheet or the appearance of sheet margin examples. Facit pictures two types which differ in the shade of the "1" on the backside. The Facit Type 1 has a long curved serif that becomes almost horiztontal. The Facit Type 2 has a short, straighter serif that mostly points down. Most of the Type 1 stamps I have seen have shiny black ink. Most of the Type 2 stamps I have seen have very dull, sometimes grayish, black ink. In my experience, the Type 2 stamps are much scarcer. Large multiples are scarce as are singles or multiples with margin attached (which can help to separate prinitngs). Mourning Stamp Facit Type I (long serif, shiny black). NH VF single. Mourning Stamp Facit Type I (long serif, shiny black). Mint Hinged VF single. Mourning Stamp Facit Type I (long serif, shiny black). Mint Hinged slightly damaged single; looks nice from front. Mourning Stamp Facit Type I, YELLOWER PAPER and ROUGH PERFORATIONS (long serif, shiny black). NH VF single. This appears to be the same type of the numeral on the backside, however this has rough perforations; the paper seems to be yellower; and the gum color is a darker yellow. I suspect that this is a different printing. Mourning Stamp Facit Type I (long serif, shiny black). NH VF Sheet of 50. Though missing top margin, I have been told by somebody that should know that this is a full sheet. Narrow bottom margin unprinted. Narrow left margin printed only with red Swedish text (on stamp segment of margin missing). Narrow right margin partially printed black and partially printed with red Finnish text. Yellow gum; usually the gum on the Mourning Stamps is white; yellow is quite unusual. A couple insignificant perforation separations. A spectacular and rare sheet. To the best of my memory, this is the only such 50-sheet I have had in 38 years. Individual break up value as singles is $600; this should be worth much more due to the marginal inscriptions and the rarity. "Mourning Stamp" printed indicia "Postal Card" sold in 1901 as a protest against the Russification of the Finnish stamp designs. There may be several types of the card; if you have one, compare closely. Mint VF. Mourning Stamp Card (reverse unprinted, so may not have been intended to be a post card) picturing an image of the Mourning Stamp (mourning the end of Finnish-design stamps as they were finally completely replaced, in 1901, by Russian-design stamps) and images of six values of the 3-Numeral Finnish issue, decorated by black ribbons and the Finnish coat of arms, with "1901" superimposed. The reverse is soiled and with writing. The front is a little worn and with a short row of needle holes at one extreme edge, but has an extremely dramatic design and appearance; it is in better quality than usual for this type of item. A rarely offered design of great import to the philately of Finland. Mourning Stamp design printed on Christmas 1901 / New Years 1902 greeting card also bearing images of eight values of the 3-Numeral Finnish stamp issue and the Finnish coat of arms. In 1923 somebody wrote an explanation of the card on the backside. The text on the front is a protest statement. On the reverse is a printed holiday greeting . Interestingly, this card seems to have been printed in the U.S. and on the front bears the statement "COPYRIGHT 1901, / FINNISH LUTH. [LUTHERAN] BOOK CONCERN, HANCOCK, MICH." This appears to have been intended for sale to the Finnish community in the U.S., but it was produced in 1901. 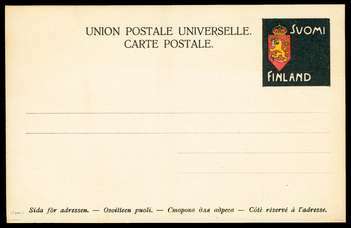 The card is a greeting card to be placed inside an envelope when sent to Finland, not a post card -- the Finnish post office rejected or destroyed post cards and envelopes bearing Mourning Stamps or such images or similar protest statements sent from abroad. Examples of items intended to be sent to Finland from abroad are extremely unusual. I am always interested in buying such items. If you are seeking such items, please let me know.